Celebrating the Two Moms in My Life! Mother’s Day is less than a week away….it’s a day to honor and celebrate the moms in our lives as well as women who have been mentors! I have two amazing moms and mentors in my life…my mom, Elma and my mother-in-law, Loraine. And the crazy cool thing is that they are awesome friends!!! 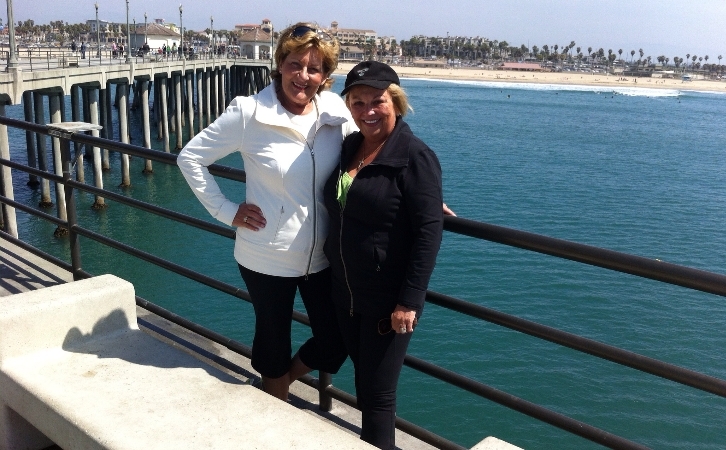 The pic above shows Loraine (left) and Elma (right) on the pier in Huntington Beach. My moms couldn’t be more different…but that’s a bonus for me as I can learn different things from them and they support me in different ways! My mom, Elma, is out there…she’s the life of the party and she somehow can make everyone feel special!! She’s also a fierce protector! I’ll never forget the time she was teaching me how to drive. She took me out driving for an hour every day for a month after I got my learner’s license. I was NOT a natural driver…she really had to teach me. We were driving down a fairly busy city street one day and I was making a right hand turn. If I remember right, I don’t think I had put my signal on. A driver on the side street honked at me and was quite irate! Mom had me stop the car and she got out and told that lady that I was a new driver and she needed to give me a break! I remember being so flustered and couldn’t believe how my mom stood up for me…even though I’m quite sure that I was in the wrong! It was a golden moment and I saw the “momma bear” come out!! I also love how my mom can make friends quickly almost anywhere she goes…she just has a magnetism about her! Best piece of advice mom gave me? Pick your battles with the kids…concentrate on the big things because you have to follow through. The small stuff is not worth it! My mother-in-law, Loraine, is a confidant…I actually call her “The Vault”, as I know that anything I tell her she will keep in confidence. She has a quiet strength about her. One of the greatest memories of have with my mom-in-law is the time that we spent living with them while we built our house. We sold our previous house rather quickly and had just barely started building our new one. We needed somewhere to live in the meantime and had two little girlies (Berks was 2 and Dylan was 8 months). Jason’s parents graciously offered that we could live in the basement and I have so many great memories of the 8 months we were there. We worked out a system where Loraine and I each cooked two dinners each week, and seriously, we went all out..dessert and all!!! Those 8 months were NOT good for my figure! I cleaned up the kitchen after each dinner and Loraine did all our laundry! I think I got the better end of that deal! Our relationship grew so much during that time and I would never trade it! Best piece of advice my mother-in-law gave me? You are your kids’ advocate….they are your responsibility and sometimes you have to fight for what’s best for them. I think my moms are such great friends because they are different! They have supported each other through tons of “stuff” as we say!!! The ups and downs and the good and bad. They have seen each other through some really tough stuff and they’ve celebrated in each others’ joys! I think that’s such a great reminder to all of us moms…we need to put time and effort into our relationships with other women!! It’s so important to have support and to have others to bounce ideas off of. I am super guilty of getting busy and doing the mom thing with driving kids around and sometimes not putting the effort I should into my friendships. Looking at my moms has reminded me that I NEED to make time for my peeps!!! Our kids could not be more fortunate to have grandmas that are amazing cheerleaders, listeners, and drivers (whew…a huge help to me!). I love that both moms text the kids, follow them on Instagram and stay connected…even when it means that they might need a technology tutorial from one of the kids! I love it! They both keep themselves very busy watching hockey, volleyball, swim meets and dance competitions! But what I treasure the most is how they pray for our kids!! That’s priceless. Here’s to you both Elma and Loraine! Happy Mother’s Day! I love you more than words could ever say!